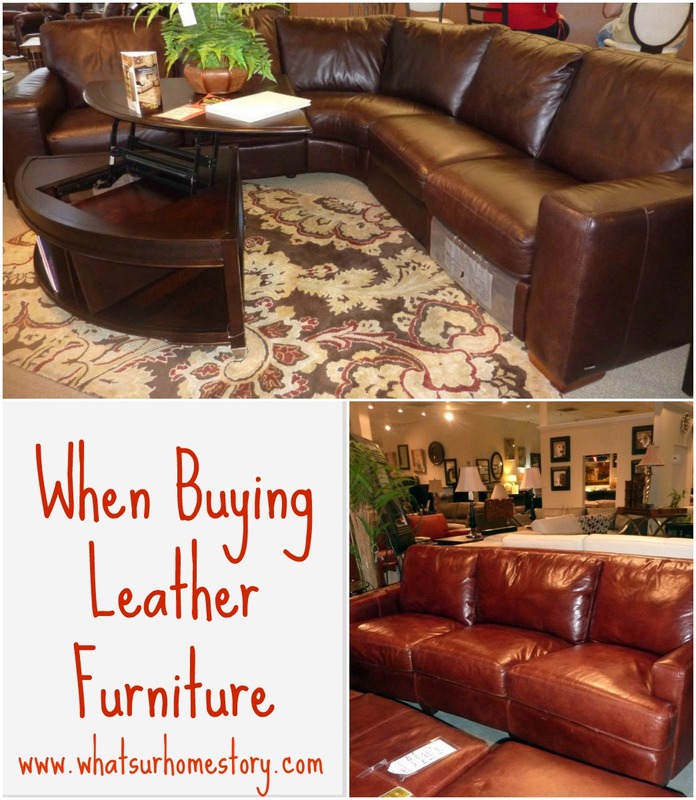 By no means am I a leather expert but in this post I’ll try to jot down whatever we learned from our year long leather reclining sectional hunt. Though we had purchased a top grain leather couch before, the whole process kinda felt new to me this time. I am going to use this post as a catch all for our leather info so that at least next time, I’ll have something to refer back to. Usually leather gets a bad rap for being too expensive (apart from the humane aspects which I’m not going to dwell into here). Yes, leather can be expensive, but nowadays there is one for every budget. The kind of leather you buy depends on, of course your budget and the type of use the furniture is going to get. Generally speaking, there are three types of leather that you usually come across in today’s furnishings. Here’s a detailed look at each type. Full Grain Leather: This is the best quality leather that you can get. The surface has not been buffed or sanded to remove imperfections of the hide. You can really feel the difference when you touch. It is very soft, supple and has a rich look. When you sit on a couch made with this leather it is not taunt rather soft, it feels like you are sitting on a nice comfy fabric couch. With use it will develop a patina because of which it commands top $$$. We came across one such couch at Hamilton Sofa & Leather Gallery. Isn’t it drop dead gorgeous? The color might have been a bit of a stretch for us but after sitting on it we were willing to part with our sectional criteria. But the sales guy at the store just kept nodding his head the other way; it’s way over our budget and definitely not meant for kid use. He told us that even if it were in our budget he would absolutely not sell it to us because the full grain Italian leather and the couch construction was not meant for rough use. This kind of leather scratches easily and will show any marks because there is no coating protecting the surface. So if that is what you are looking for or if you want it for rooms that won’t get much use then go ahead. Top Grain Leather: This is the 2nd best quality and is less expensive and more stain resistant than full grain leather. Quoting from Wikipedia, “It’s had the “split” layer separated away, making it thinner and more pliable than full-grain. Its surface has been sanded and a finish coat added to the surface which results in a colder, plastic feel with less breathability, and will not develop a natural patina.” From what we have seen, the coating finish on this type of leather varies with each manufacturer. So the price depends on the thickness of the coat, the less thick the coating the pricier the leather (because it will show more of the qualities of full grain leather). Here are two examples of higher end top grain pieces; the first one is a couch from Hamilton Sofa & Leather Gallery and the second is from Belfort Furniture. I scratched these with my nail to check and both these pieces did show marks. Though texture was not as rich as the full grain one, they were really good. An example of middle range top grain leather is the sectional that we ended up buying from Havertys. This one did not show any scratches or marks (meaning the coating was thicker) which we liked as we were looking for something kid proof. It is quite taunt when you sit on it at first but breaks in after a few days of use. Split Leather /Bicast Leather: This is a leather by-product that is made by laminating polyurethane with split leather (explains the plasticy feel). Split leather is leather created from the fibrous part of the hide that is left over once the top grain has been separated from the hide. It is cheaper than top grain and easier to clean but with use the polyurethane coating will crack and split free from the backing. In the UK and New Zealand they are not allowed to call this leather at all! Bonded Leather/ Faux Leather: I know I am going to break some hearts here, this is not leather at all. In fact bonded leather upholstery is a vinyl upholstery that contains about 17% leather fiber in its backing material. The vinyl is stamped to give it a leather-like texture (via Wikipedia). A lot of middle to low end stores will try to sell this off as leather. Always double check. When we started talking “top grain, full grain, bicast” they kinda change the tune and say “well really it is not leather”. So do your homework. Here is an example of a sectional (an excuse of a pic taken from my phone) that we found during our hunt. The best part of this is how affordable it is. The sales manager at Ashley Furniture told us “You can get the leather look for much cheaper and after a few years when you are tired of it get a new one. Still will cost you less than real leather”, which I think works for some folks. Not sure if it is affordable in the long run but definitely worth considering for people starting out. Another con for this one is that with use it will chip and crack like what happened to our faux leather bench (see below) that we had to reupholster. Another important factor in your selection process should be how you plan to use your furniture. A family room couch will get used a lot more and should be able to stand up to more daily wear than say a guest room chair. Same holds true for a recliner. Apart from good bones and construction you also have to take into account the ease of use of the switches/ moving mechanism (for e.g. for a recliner). If it is going to get a lot of abuse it is always better to go with top grain. How Much of the Actual Piece is Leather? Some of the top grain couches have leather only where you actually touch, i.e where you sit and at the hand rests. The back and sides are split/bonded leather. Again not sure if it is a big deal as these don’t get much wear. Buy upholstery with zippered seat cushions so you can get the cushions refilled if needed. Leather takes on the temperature of your body within 12 seconds, so the notion that leather is cold is a misconception (from here, I still don’t believe it). Update: It has been over 4 years now that we’ve been living with our Havertys sectional. We LOVE it! It has held up to all the kid abuse very well. « The Dining Room is Done! Thanks so much for the valuable information. I am sure it is going to be lot of help when we go out shopping for leather furniture . Hi, my wife and I were actually looking at the same sectional you purchased at Haverty’s. Is it still holding up okay for you? Thanks for the informative article.